By Adam Solomon Zemel. Cross-posted from the Breakthrough Institute. 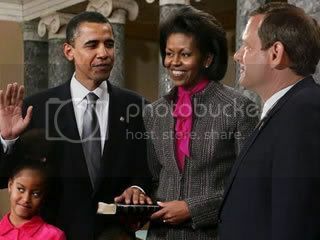 Barack Obama has finally been sworn in as the 44th President of the United States of America. For once, there is no debate among pundits or Capitol Hill insiders about what Obama's first priority will be as President. It seems like President Obama has been working on crafting an economic stimulus bill since November 5th, and now the real work begins in earnest. Last week, despite reports from the Congressional Budget Office that our economy will likely face $2 trillion of lost production over the next two years, Obama rolled out a stimulus plan that only spends $825 billion to make up for this gap in production. A summary of the American Recovery and Reinvestment Act, released by the House Appropriations Committee, gives us the first detailed look at how this money will be spent and invested. Reading through the section devoted to energy in particular, a glaring lack of spending and the absence of any sort of cohesive guiding framework both give reason for pause. Every dollar of public investment produces, on average, about one and half dollars of GDP, achieving a "multiplier effect" that makes federal spending ideally suited for maximizing stimulus investments - a critical criteria when facing such a massive economic shortfall. Considering the fact that only $550 billion of the stimulus will be in the form of spending and investment, it seems that the stimulus in its current form won't even attempt to address the full $2 trillion dollar economic gap. The other $275 billion contained in the stimulus will go to tax cuts, which economists reckon will have little to no "multiplier" effect and will likely make up for no more than $275 billion of lost production. As it stands, Obama's stimulus proposal may only address half of the economic shortfall projected by CBO (stimulating roughly $1 trillion in increased economic production). And it'll be worse if CBO's projections turn out to be optimistic (as scary a thought as that is!). That leaves economists like Nobel Laureate Paul Krugman concluding, "the Obama plan is nowhere near big enough to fill this 'output gap.'" So given the risks of not doing enough, why does the Recovery and Reinvestment plan attempt to address just half of expected losses in economic production? Or as Krugman is left wondering, "Why isn't Mr. Obama trying to do more?" Obama has hinted that the scale of public investments in the stimulus has been constrained by a lack of "shovel ready" projects, projects that are ready to go and will expend most of their money and hire most of the associated jobs within the next 24 months. Anything that isn't shovel ready might not yield its peak economic benefits until more than two years from now, reducing the timely impact of the stimulus, or so the argument goes. So perhaps there is not enough that is "shovel ready." But looking at this stimulus summary, that's hard to believe. In addition to $22 billion for efficiency retrofits, Obama is only planning on spending $32 billion dollars on clean energy research and development, demonstration, deployment, and enabling infrastructure, such as a modern 21st century electricity transmission grid. All these projects and more are necessary and carry a much bigger price tag than $54 billion--even over the next two years. Robert Pollin's Green Recovery report, for example, outlined $100 billion in smart investments in clean energy projects over the next two years - double what is contained in the current stimulus plan. Another sign that public investments have not been maximized can be found within the House's own stimulus summary. The section summarizing transportation investments explicitly states that while there are more than $65 billion in shovel ready, backlogged public transit and rail projects, the stimulus will only allocate about $10 billion to mass transit investments. This makes it pretty clear that "shovel ready" has not been the consistent standard for apportioning expenditures for the stimulus, and raises plenty of questions. If Obama is not spending to the full capacity of shovel ready projects on smart public transit investments, there is little evidence he has maximized public investments in other areas, especially the clean energy investments so critical to our economic, national security and climate objectives. Underfunded or not, the series of clean energy investments included in this version of the stimulus reads like a laundry list of piecemeal tax breaks and incentives that simply do not cohere into any kind of unified plan. It seems that there is no coordination between the different intended energy expenditures and no central objective or strategy behind then, other than creating new jobs. Given the momentous challenges facing America today, challenges that Obama spoke eloquently of in his inaugural speech today, he can ill afford to waste any opportunities to make stimulus investments pull "double duty" - making investments that both create jobs in the short term and set the foundation for smart, sustained growth towards a new 21st century economy. So when it comes to clean energy investments, the stimulus must follow some kind of plan, designed to organize investments that are most effective at building the new energy economy we need. They should evidence a clear vision of the clean energy economy we're trying to create and follow a diagnosis of the key barriers and challenges standing in the way of that vision. Such a vision and diagnosis would in turn inform a strategy of framework to organize and guide where and how to best invest as much stimulus money as possible in spurring the transition to a new, clean energy economy. The high price of clean energy technologies is currently the greatest obstacle hampering the transition to "harness[ing] the sun and the winds and the soil to fuel our cars and run our factories," an objective Obama spoke of today. We've therefore argued for a strategy to spur clean energy development and deployment designed to drive down the costs of clean energy - a strategy to "make clean energy cheap." If Obama were to sit down with his top-notch energy and economic teams and a red pen with a single goal in mind--"make clean energy cheap"--the energy section of the stimulus might suddenly expand in scope and have a new, cohesive and strategic focus. The stimulus legislation is currently making its way through the House, and certain pundits have predicted that Congressional Democrats will bulk up the investment end of the bill before it is passed and sent over to Obama's desk. If this is true, there would be no better way to increase spending, to meet both short-term and long-term objectives, than increasing investments to make clean energy cheap and abundant. It's President Obama now. For him, and our nation, the real work begins today. The stimulus is the first chance to get it right. Obama administration needs to realize that in several months economic crisis and soaring deficit will be solely his administration’s and his party’s problem, so for any previous or future mistakes he’ll have to take the blame. Two-three months from now nobody will remember Bush’s policies and the Democrats have to be more careful on the long-term effects of massive spending. If the new stimulus fails, just like the past one, then this will balloon into Obama’s first political problem. We have to also realize, that on the long-term we won’t be able to afford more bailouts and there has to be alternative solutions, since we are passing the trillion Dollar deficit boundary. Printing more money can be utilized as short-term tool, but on the long run it will devastate economy. Something needs to be done immediately, but more regulation & spending does not seem to be a logical answer, we need another alternative solution. Maybe we should take pure libertarian approach and let the free market decide who wins or loses? This will cause social unrest and chaos, so as a society we can not afford this option either. Maybe we’ve killed the goose that laid eggs for us?